Yesterday was a busy day with the Roman unveiling of the Sarpedon krater and the breaking news that Shelby White had handed over nine of her antiquities (and that one more would follow). 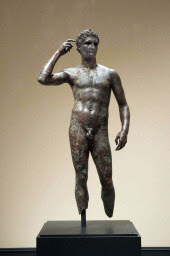 It would have been easy to overlook Thursday's press statement that Italy will continue to seek the return of the Fano Athlete from the Getty ("Italy won't give up on Getty Bronze", ANSA, January 17, 2008). Italy won't give up its claim. Will the moral pressure be brought to bear?